One very common way in which theatre artists make universal themes carry weight beyond a distant historical or mythical moment is by tearing characters in the stories out of the history books and legendary annals and giving them a contemporary spin. The thinking, I guess, is that if you make figures of yore seem more like people that we can relate to, the themes they articulate on stage will resonate more strongly today. Writer/actor Jason Craig and composer Dave Malloy have been very good at doing this in the past. In shows like Beowulf: A Thousand Years of Baggage, the duo connected the legendary figure of Beowulf with the preoccupations of our own time. They turned the Anglo Saxon hero into a nerdy rockstar and surrounded him with equally nerdy academics all trying to decipher his tale. In doing so, we understood something about the way in which legends are born, perpetuated and ruined over centuries of academic research that wouldn't necessarily have come across in a telling which focused more on re-creating the Anglo Saxon world. The duo's latest musical theatre piece for Shotgun Players in Berkeley, Beardo has some of the same appeal. Centering on Rasputin, the infamous aide to the Russian royal family, it combines Malloy's quirky anti-musical song-writing sensibility (which encompasses influences as broad as opera, kletzmer, doo-wop jazz and indie rock) and Craig's downbeat, terse-humored language, to draw a parallel between Tsarist Russia and a hillbilly American backwater that seems ancient and yet very real today. The production begins and ends with Ashkon Davaran's Rasputin lying senseless on the ground in the middle of a wood. The opening song (and returning refrain) insists on his downtrodden roots "in a shack in a field in a shack in a field..." and Davaran's homespun accent also gives his character a hick tang. The parallel successfully makes Davaran's Rasputin seem like a modern day mystic, a sort of Kurt Cobain meets Jim Jones. But the emphasis on turning Rasputin into a 21st century Messiah -- which creates a lot of edgy humor and spawns brilliant songs -- comes at the expense of digging more deeply into the play's otherwise scantly- treated ideas. At one point, a 30-strong chorus of Russian peasants comes on stage and sings an ardent, harmonically-rich torch song on the theme of what it means to live under a useless, despotic monarchy. But the amazing theatrical moment is wasted in the grand scheme of things because Craig and his colleagues don't attempt to link the ideas expressed in the song or even the visual concept of suddenly introducing so many people on stage with much else in the production. 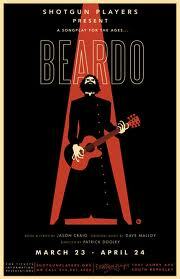 The result of this is that Beardo, though very entertaining, ultimately, doesn't add up to much beyond a fun night out. It's not enough to indicate that the problems facing another time and place are very like the ones we face today by giving characters a contemporary spin. A dramatist still has to do the hard work of going deeper to make a theme meaningful on stage.